Motorola India has announced that it will be launching the Moto G5S Plus, soon in the Country. The phone has already been launched in the US, so we know what we can expect. The highlight of the Moto G5s Plus are the dual rear cameras, which are 13 megapixels lenses with an f/2.0 aperture, depth editor, a color balancing Dual LED Flash. The cameras support 8x digital zoom for photos and 4X for videos, and support Auto HDR, Video Stabilization, 4K video recording @ 30fps and slo-mo video.As with the other Phones in the series, the rear cameras are housed in a dial similar to the Moto 360’s. The front camera on the device is an 8 megapixels wide angle lens, with an f/2.0 aperture and an LED Flash. 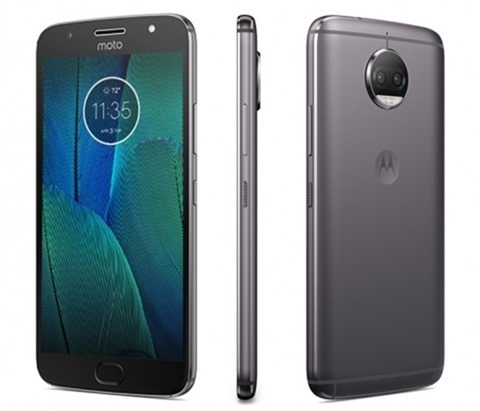 The Moto G5s Plus runs on Android 7.1 Nougat, and is powered by an octa-core 2.0GHz Qualcomm Snapdragon 625 processor, with an Adreno 506GPU clocked at 650 MHz. The device has 3GB/4GB of RAM, with 32GB and 64GB of internal storage, with up to 128GB of expandable memory supported via a dedicated microSD card slot. The G5s Plus sports a 5.5-inch Full HD 1080p display with 401 PPI, and Corning Gorilla Glass 3. The device has a water repellent nano-coating, and a full metal body. The physical button on the front panel serves as the fingerprint scanner, and for one button nav gestures. The G5s Plus is backed by a 3,000 mAh battery which supports fast charging. The phone supports Dual SIM Cards, 4G LTE with VoLTE, Bluetooth 4.2 LE + EDR, GPS A-GPS, GLONASS WiFi- 802,11 a/b/g/n 2.4GHz and 5GHZ, has a micro USB port, a 3.5mm audio jack. The device will be available in Lunar Gray and Blush Gold colours. And according to the above teaser’s colour, the Moto G5s Plus could be launched as a Flipkart exclusive in India. It is unclear if the Moto G5s will be launched alongside the Plus version.